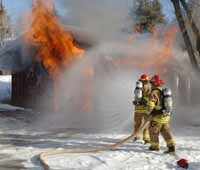 The Ketchum Fire Department relies on volunteers. Three out of every four firefighters are volunteers always on call, and many of these 38 volunteers told the City Council on Monday that they cannot withstand any more cuts to their training program. Their annual budget peaked at $29,000 in fiscal year 2007-08, and the council has cut it down every year since then, leaving it at $14,000 this year. Greg Martin, an engineer and advanced EMT with three years in the department, said the volunteers understand that cuts have happened across the board because of the recession. "I understand times are tough," he said, asking for the council to restore the training budget to its 2007-08 levels, which he realized wouldn't happen in one year but gradually. "Good times or bad, we still need the training. It's the calm within coming from being prepared, knowledgeable and well-trained that shines through in emergency situations." Ketchum firefighters must each be trained in not only fighting structural fires but wildland fires and automobile fires. They're also trained in emergency medical service, swift-water rescue, avalanche rescue, backcountry rescue, rope rescue and dealing with hazardous materials. This all takes 125 training hours over the span of 13 weeks, according to nine-year firefighter Karly Maratea, president of the volunteer association. After that, a first-year firefighter is on one-year probation, and the training never stops throughout his or her career. Fire Chief Mike Elle said volunteers are paid for their time during training—which helps with recruitment and retention—but most of the budget goes toward bringing in instructors. "Because of the budget shortfall, we were unable to sponsor a recruitment class last year," Maratea said. She said the volunteer association had to dip into $26,000 of its fundraising money last year for training. "We believe safety and training go hand in hand," she said. "I hear you loud and clear," said Mayor Randy Hall, vouching to gradually restore the training budget. "It got by when the budget was contracting. Everyone got nicked. I'm going to work real hard to get you where you need to be." Councilmen Curtis Kemp and Larry Helzel agreed with Hall's plan. Helzel added that the volunteers are also in a position to help themselves, and advocated that they inform the community of the critical role they play. "More people than you think would be willing to invest in your training on a charitable basis," he said.